Written by Dr. Vasantha K S and medically reviewed by iCliniq medical review team. • What is Sensorineural Hearing Loss? • What Causes Sensorineural Hearing Loss? • How is BSHL Treated? Our ears have three portions namely outer, middle, and inner ear. When the inner ear is damaged, sensorineural hearing loss occurs. It is referred to as sensorineural because the inner ear and hearing nerve need to work together for proper hearing. What Causes Sensorineural Hearing Loss? Will there be hearing loss on using noise cancellation headphones 10 hours a day? What can be done for age-related hearing loss? Will typhoid cause hearing loss? Maternal infections such as rubella and German measles during pregnancy. Prolonged exposure to loud noise. Viral infections such as measles, meningitis, and mumps. Acoustic trauma due to exposure to loud sounds such as firearms or explosions. Ototoxic drugs such as certain antibiotics and chemotherapy drugs. Ear tumors and growths may also affect the hearing health. What are the symptoms of Bilateral Sensorineural Hearing Loss? Those with bilateral sensorineural hearing noise can hear muffled sounds but not understand the context of what is being spoken and this leads to gradual isolation. There is reduced sensitivity to soft sounds. This causes problems with communication, interpersonal skills. It also affects learning and school performance in young children. Perception of loud sounds is altered causing social withdrawal and loneliness. How is Bilateral Sensorineural Hearing Loss Treated? A thorough evaluation of the extent of the hearing loss is necessary to be conducted by a hearing health professional who would diagnose the actual type of hearing loss and suggest appropriate treatment. In case of bilateral hearing loss, which is mild to moderate, hearing aids may help. But, in case of severe hearing loss, even using hearing aids will not help as it would just amplify the distorted sounds and in the presence of background noise, it would lead to more confusion and frustration. In that case, cochlear implants may be the solution. A cochlear implant is an electronic device that is placed in the ear surgically and stimulates the hearing nerve by converting sound waves directly to electrical impulses. 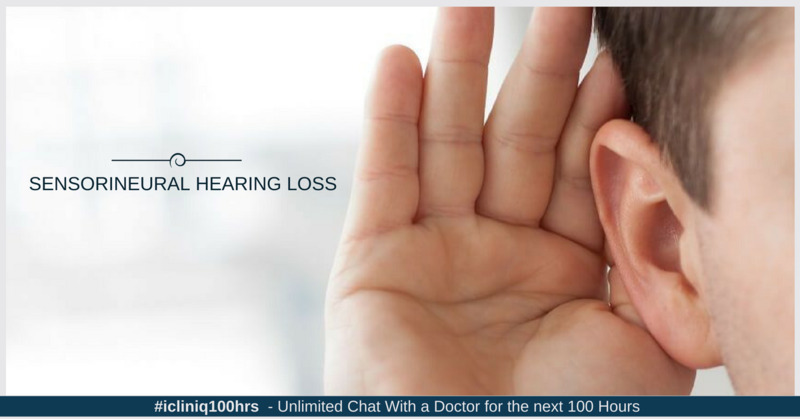 Do you have a question on Hearing Loss or Impaired Hearing? Is it possible for mild hearing loss to reverse by itself? Please suggest ayurveda treatment for hearing loss. A pulp is seen in the ear after accidental eardrum damage. What is to be done?